Remember how much I love the royals? In some ways, this book selection should come as no surprise. 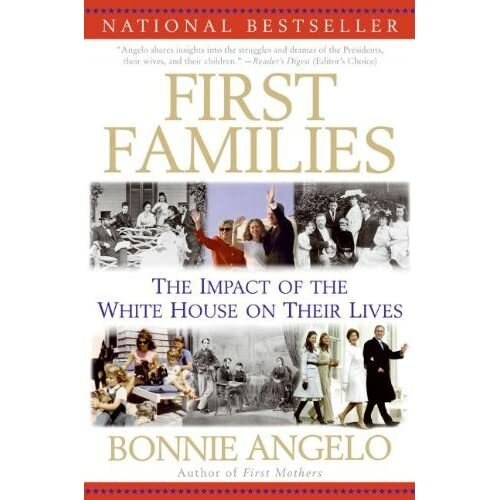 The families of our presidents are often viewed as a type of American royalty. They are, after all, the closest we are going to get; and they are fascinating. Maybe it's the mystical crossing of politics and celebrity that capture my attention. Whatever it is, I cannot turn down a read about the personal details of a public figure - even when the book is badly written. Case in point: First Families. At the start of 2012, I set out to read 52 books this year. I just finished book #26, marking the halfway point. At this point, I am about one week ahead of schedule, which feels good. I wanted to take a few moments and reflect on the journey thus far. "A truly good book reaches me better than to read it. I must soon lay it down, and commence living on its hint. What I began by reading, I must finish by acting." I feel as though I have been neglecting you terribly. I have missed writing in this blog with the consistency that I did earlier in the year. Take heart in knowing that I am still reading avidly. I have hit another point in this challenge where I am immersed in several thick volumes; therefore, I am not finishing things quickly. It is a frustrating point in regard to the blog, but know that I am enjoying what I am reading and cannot wait to tell you all about it. If you read my last post, you already know that Kevin and I listened to this book together during our dual Michigan trips. It's proven difficult to finish it up since, when not traveling, most of the time we spend in the car is short trips. With the help of a multitude of wedding errands, though, we brought this case to a close. (Yes, that was a terrible law pun. Please forgive me.) I had never read a whole Grisham novel before, despite my former roommate's penchant for them, so this was a new experience for me. It was also really interesting for Kevin and I to "read" a book together and be able to observe how we think about and react differently to the story.